#322 "Cruel, Dark, and Handsome - Meet the Lords of Darkness, Miniatures Poster"
Stars of both the old and new Fiend Folio, dark creepers and dark stalkers finally get their day. A guttering flame on the brink of eternal darkness, visit Balefire, your only refuge on the Plane of Shadow. 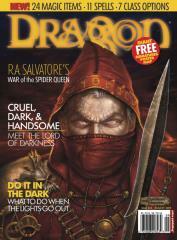 Check out the statistics for the characters and learn a few secrets about R. A Salvatore's War of the Spider Queen series. "Now they will know why they are afraid of the dark. Now they learn why they fear the night." Make your players afraid of their characters' shadows with this DM advice about darkness. Build your game world from the ground up—with your players' help! Son of Chaos, brother to Night, god of darkness, Erebus holds court over beings of pure night. Read about the Lord of Darkness, his cults, his spells, and his plans for the world. Plus, "Arcane Lore," "Bazaar of the Bizarre," "DM's Toolbox," "Faiths of Faerûn," "Dungeoncraft," "Under Command," "Elminster's Guide to the Realms," "Silicon Sorcery: Shadows on Undrentide," "Sage Advice," and more!